Five long-time friends gather in a London pub and plan a tramping getaway in Sweden. Afterwards, Luke accompanies Robert into a liquor store only for the two of them to walk into the midst of a holdup. Luke hides behind the end of the aisle and can do nothing as Robert is beaten and killed by the hoodlums. Six months later, the four of the friends take the tramping trip to remote northern Sweden to perform a memorial for Robert. Luke suffers guilt over feeling he should have done something to save Robert. As they plan to return to the lodge, Dom falls and twists his foot. Facing a fourteen hour trek with an injured member of the party, the group make a decision to take an off-the-trail shortcut through the forest. However, once in the forest, the group encounter many disturbing things – the bodies of slaughtered animals left hanging amongst the trees; ritual markings; a cabin with a pagan effigy; disturbing dreams; and seeing vast shadowy shapes moving through the trees. The Ritual comes from David Bruckner, a US director who made his debut as one of the three directors on the mass insanity film The Signal (2007). Since then, Bruckner has made the Amateur Night episode of the horror anthology V/H/S (2012), which was later expanded as the full-length film Siren (2016) under a different director, and the The Accident episode of the anthology Southbound (2015). 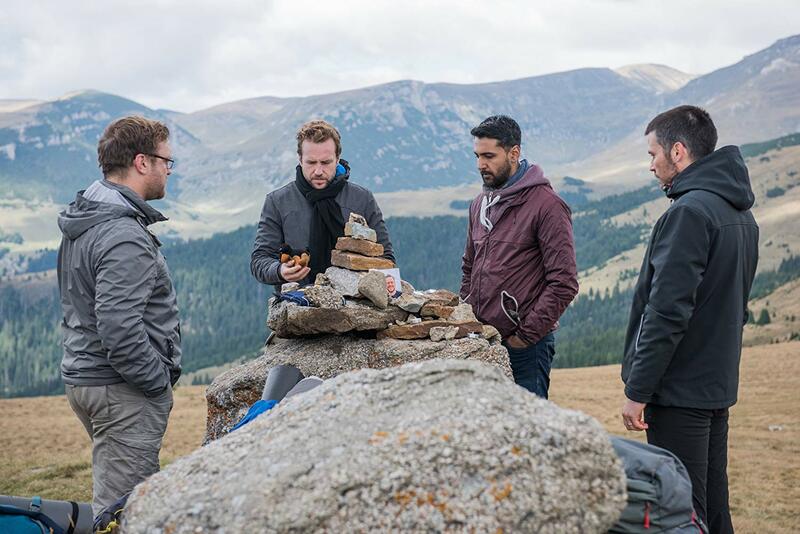 The Ritual represents Bruckner’s first full-length film as a solo director. Bruckner holds your attention with a captivating opening scene where we go from a pub reunion among the five friends, which comes with an easygoing jocularity of lads having a night out, to Rafe Spall and Paul Reid walking into a liquor store and in the space of turning around find themselves in the midst of a robbery – one where Spall is forced to watch while hiding behind the end of an aisle as Reid’s brains are bashed in. This puts The Ritual off to a strong and jolting start. Bruckner never subsequently delivers any scene that holds the same kind of strong kick but goes in quieter more spooky directions. He takes us to the remotes of Sweden (in actuality location shooting in Romania) and the film, as we follow the men on their journey into the forbidden forest, becomes one of slowly accumulating mood. What we have becomes something not dissimilar to The Blair Witch Project (1999) with a group of people lost in the forest where they keep encountering occult symbols and are haunted by mysterious happenings – albeit a Blair Witch with better developed internal conflicts among the group, no shakycam Found Footage and where there is an actual witch. One thing that also must be complimented here is the fact that the Romanian locations and forest are stunningly shot. The degree of brooding and foreboding that Bruckner manages to conjure is very well achieved. Bruckner allows this to pay off with some eerie, almost subliminally glimpsed shots of large shadowy shapes moving in the background or people being dragged away by things unseen. Or the eerie and surreal images of Rafe Spall having visions of the aisle from the liquor store in the middle of the forest. The creature that we eventually get is something quite unearthly.